Today, FlagRunners help a local YMCA in Vernon Hills, fix their flagpole knot. 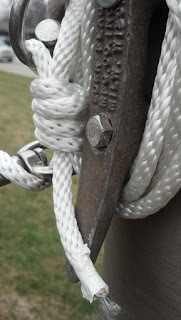 An improper knot can lead to disaster, if the flag and rigging come down. It happens, we had a company call with a 20 x 30' US flag flying across the highway not to long ago. In this case however most all is well, the knot was at the cleat. So if the square knot they were using came undone, it would most likely not compromise the system. We just thought we would fix it up while we were on hand to do so. There is more than one way to fly a flag. There is certainly more than one right way to do it. FlagRunners have seen it all, from halyard that was melted and fused together, to poles with welded chain loops. There really is no contraption anymore at this point that would surprise us. In many cases, resourcefulness pays off and keeps the flag flying for your situation. In other cases, it creates more problems than you may want to admit to causing. There is the tool-shed technique. Basically heading to your supply of left over parts accumulated from years obtaining, fixing, and managing other things: fences, yard, garden. what have you. You may find a great deal of crafty solutions to putting the flag "back on her feet" to speak. Bare in mind..
"If your flag pole has a snag, rest assured it's eating up your flag." We are not saying all DIY (do it yourself) systems are bad. We've seen some very clever ones, but you do run a risk of having the flag prematurely retire. Weigh the options. $50 in parts vs. flying more flags per year/having to change the flag, or fix it more often. Quickly the quick fix comes into perspective. A durable flag is always the most cost effective (avoid chain stitch in the open winds). Ask or confirm that you are getting a lock stitch constructed flag like Flag Desk offers first. Not a promotional substitute model. FlagRunners stopping at the local Vernon Hills, IL YMCA found three flagpoles. All had the ability to fly. They have only one flag flying, the American flag, maybe just for the winter. But one of the flagpoles has a cleat cover box (unlocked) while the other two did not. The knot added to the tight area allowed in the cleat cover box did not allow it to close so we moved the knot up top and out of the way. This knot then uses the flag itself as a safety from the heading keeping the halyard up on the flag pole if the knot itself comes undone. We run to all sorts of different displays but I think this is a first for us. Perhaps they only needed security on the far pole, or they were testing the box to see if they liked it. In any event. It is nice to see a flag flying! Post us a comment or tell us the rest of the story if you are privileged to know. We want in on the action.